Did you know there is a bit of authentic Ireland in the greater Columbus area? Want to step back in time 800 years and treat yourself to a pint? There is a pub in a quaint city called Dublin in the greater Columbus, Ohio area where you can do just that. 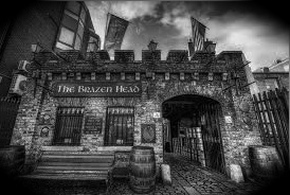 It's called The Brazenhead and it's modeled on The Brazen Head which is the oldest pub in Dublin, Ireland. According to their website, the bar and the fireplace were imported from Ireland and all other decor and artifacts are based on like items the owners encountered in their travels throughout Ireland. The Menu features fish and chips, as one would expect, but also some decidedly un-Irish food such as quesadillas, chicken wings and a myriad of burger concoctions. As for what to drink: The Brazenhead features dozens and dozens of Whiskeys, Irish Whiskeys, Bourbons and Scotch, as well as, premium gins and tequilas. And what Irish pub would not have Guinness? There are many other beer choices, too, and a small, but decent wine list. If you love all things Irish, then you must plan to visit The Brazenhead in Dublin, Ohio. Have a pint or two and let us take you home.